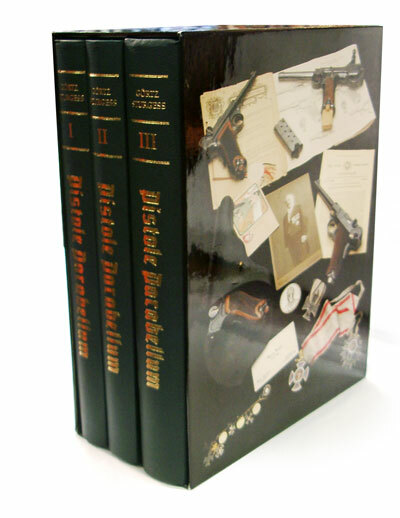 PISTOLE PARABELLUM, HISTORY OF THE "LUGER SYSTEM"
Comprising an Editor's Preface, Author's Foreword, Introduction, sixty-three chapters of profusely illustrated text plus a Bibliography, Glossary, and comprehensive 34-page Index, this is the most complete and authoritative account ever published of every aspect of the Pistole Parabellumthe world's most collectable handgun. 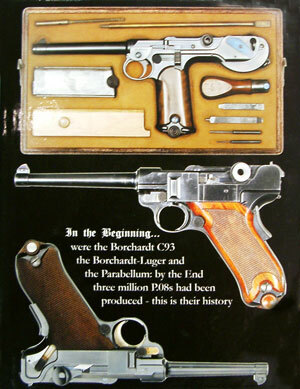 Volume I discusses and depicts the historical antecedents of the Parabellum with emphasis on the Borchardt C93, and documents the derivation of the Parabellum from the C93. The bulk of the volume is devoted to illustrated descriptions of all Parabellum prototypes and Old and New Model variations as adopted by the Swiss and German militaries and manufactured for foreign contract and commercial sale. 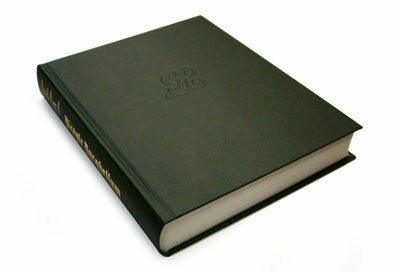 Volume II begins with an in-depth, historical discussion of the four Parabellum production lines (in Germany, Switzerland, and Britain) and all the military, contract and commercial models manufactured by each; the official production and military inspection and procurement procedures, plus an exhaustive, fully-illustrated study of markings (factory internal, proof, acceptance, serial numbers and unit), ending with a chapter on supplementary police safeties and selective-fire conversions. 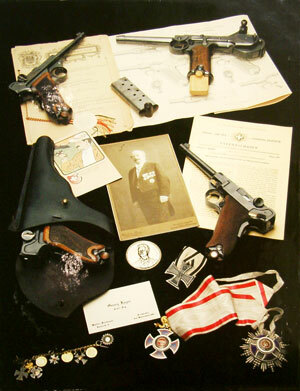 Volume III covers all the many accessories and ancillaries produced for the Borchardt C93 and the Parabellum, including commercial, military and police manuals; holsters, magazine pouches and holster/stocks; magazines and drums; maintenance accessories; Swiss and German sub-calibre conversions; cases and cartons; and ammunition (7.65mm Borchardt and 7.65mm and 9mm Parabellum), including headstamps, special loadings, and military packaging and labelling. This is the first and only Luger study to tackle head-on the vexing issue of fakery. The nearly two thousand sharp, clear illustrations in these volumes, mostly in full colour, painstakingly depict and compare the key details of hundreds of genuine examples of exquisite rarity with those of known fakes. In keeping with this as an ongoing theme throughout all three volumes, the exhaustive Index in the back of Volume III directs the reader to over 50 specific entries under the heading "Fakery".